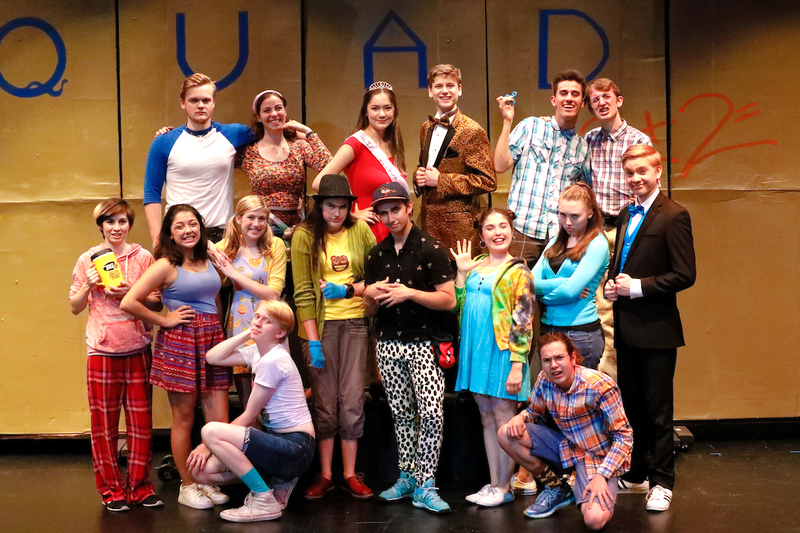 A Theatre Near U is presenting another Tony Kienitz world premiere, this time taking a farcical trip down memory lane back to the all-important crises of high school. 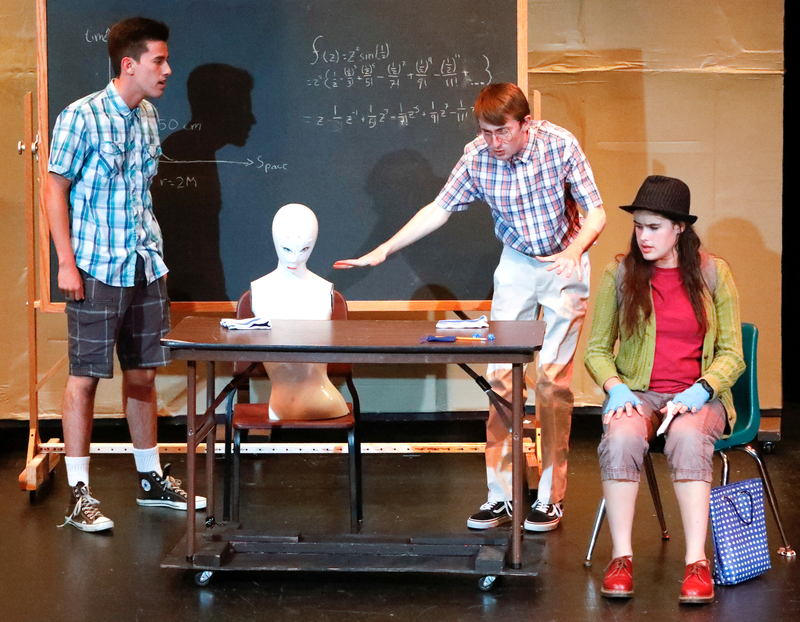 His latest work, Like, Like, Like?, presents a unique view of high school to which audience members of all ages can relate. For those whose high school years are viewed from a distance through the rear-view mirror of their life, this presentation will likely trigger a bit of nostalgia. For those in the midst of their high school years, these young actors may embody a view of their friends with a level of familiarity. And for those eagerly awaiting to start high school, the characterizations may show them that they have nothing to fear and plenty to savor. Kienitz and his wife and collaborator, Tanna Herr, co-direct this production. As is their practice, they bring a cast of eager young thespians aged 13-19 together to entertain and delight audiences. Their efforts with their cast are extremely collaborative, as they work together to refine the script through the rehearsal process. Kienitz especially wanted to bring this script to life through A Theatre Near U to give these young actors a chance to not only debut an original work, but to give them the experience of acting in a farce to which they can relate. In a conversation with Kienitz at the opening night gala, he expanded on his reasoning for writing this particular script. He stressed that there isn’t much farce available outside of bawdy adult productions. While many schools may take on shows such as Noises Off, the material is both written for and aimed at adults. Like, Like, Like? is a script written specifically for the young actors involved in A Theatre Near U to explore. The plot exaggerates situations that are immediately familiar to them, as it lets them tell the story in their current lexicon. Topics, including exchange students, truth, fitting in, and the all-important election of the Homecoming King and Queen, are explored and turned on their heads. There is also a bit of a moral in the ending that collects the fragments strewn throughout the story. The familiar high school stereotypes are all there. There are geeky robotics boys, drama nerds, exchange students, popular kids, an instigator, the forlorn high school graduate who just can’t leave, and a couple of kids who don’t exactly fit into a neat clique. Most everyone will see a glimpse of themselves or somebody they know (or knew) from high school somewhere in this production. This cast is extremely well versed in the script and well-rehearsed. The dialogue is often rapid fire, and nobody misses a beat throughout some very convoluted exchanges. The actors all enunciate and project well in the space, sometimes a little too well in fact for those with sensitive hearing. These kids get to experience and deliver all of the elements of British farce in this production including slamming doors, mistaken identities, and underwear, along with gender bent footwear, and a lengthy Act 2 scene incorporating the entire cast in antics reminiscent of the best of the Keystone Cops. The athleticism on display, particularly in the chase scene, is impressive, and the timing is exquisite. The cast includes: Alia Cuadros-Contreras, Johannes de Quant, Lauren Emo, Anna Feenstra, Monica Hobbs, Emerald Inay, Emily Liberatore, Daniel Lindstrom, Austin Nipper, Alyssa Rojas, Quincy Shaindlin, Mia Trubelja, Robert Vetter, Gil Weissman, Sam Woodbury, and Jackson Wylder. Several characters are clearly drawn, while others are a little less developed. Emily Liberatore’s characterization of Colleen Musker, the “Thespian Overlord,” is of particular note. Her presentation demonstrates depth and range of feeling, especially in a compelling monologue delivered in Act 2 after an implied torrid encounter. Wylder’s characterization of Dave Miller, the instigator, is nicely done. He commands a position of authority in the story, somewhat reminiscent of The Engineer in Miss Saigon, but without the nefarious overtones. He only shares Dave’s reasoning for his actions once complete chaos ensues. As is so important in successful farce, Wylder injects a believable note of seriousness into his character’s outrageous actions. The robotics boys portrayed by Nipper and de Quant, while greatly exaggerated, both hit the geeky science/math stereotype on the nose. They each stay in character beautifully, both in manner and in speech, and they provide an adorable snapshot into their lab-based subculture. Both Feenstra and Cuadros-Contreras have the opportunity to play with accents, which they do well. They each swallow a few words strategically in character, each time adding to the comedy at hand. Weissman delivers his lines with evocative feeling and conviction playing a pair of twins (with a twist). He has several short, complex monologues that are rife with humor that lands well, but his physicality is somewhat single dimensional. Whether directorial or personal in nature, he relies on a single, continuously pained expression and stance that beg for a bit more variety to align with the emotion in his words. Shaindlin’s Orson provides some comic relief in Act 2, though it might be giving away a bit too much to say exactly how in this review. Suffice it to say that his deadpan delivery in the face of outrageous physical comedy is priceless. Vetter’s Mitch is an over-the-top drama kid incorporating every stereotype imaginable. Vetter plays him without flinching, and with great comic flair. There is no subtlety in Vetter’s character, but there doesn’t need to be. Mitch is the least inhibited student at that school, and Vetter makes that very clear. In a particularly amusing drama class segment, Vetter, along with Hobbs, Liberatore, Rojas, and Inay, launch into a rapid sequence of contorted callouts from several famous musicals and song lyrics to make a point about the importance of keeping drama alive. One of the less endearing antics from the drama class is a repetitive sequence they invoke each time their class, or practices, are perceived as endangered. It’s funny the first time it happens, but it’s a slightly overused gimmick. At some points during the performance, each character has cause to scream or squeal alone or in groups, and some characters do so on multiple occasions. It’s part of the script and has been a part of the youth culture for several decades. Unfortunately, in this intimate performance space, it becomes a bit grating, and even slightly painful at times. The set is simple. Several rolling screens are placed upstage spelling out “QUAD” or “DRAMA” depending on which scene is taking place. There are also several large, rolling, trunk-like pieces that serve as benches on occasion. The screens are turned and the benches are moved on and off the stage by the actors in carefully choreographed set changes accompanied by silent vignettes and Eastern European music over the sound system. As an added bit of theatre, in addition to the full performance space, the back hallway leading to dressing rooms is used in the brilliantly choreographed chase sequence in Act 2. Since this scene is taking place in the drama wing of the school, aptly named “High School,” it adds to the action, and it gives the actors additional runway for their antics. One might even suspect that the script was written with this specific performance space in mind given how perfectly the action fits the space. The most surprising aspect of the show is one sequence that occurs invoking a 2006 parody of a well-known song. It is amazing how well this fits the current times, but perhaps not for the reasons originally intended. Ah the beauty of satire. While a few aspects of this story might not have universal appeal, much of it will hit home in various ways. Undoubtedly, most audience members will find themselves laughing at the various antics in spite of themselves. Sometimes, it’s worth a night out to revel in the absurdity of life, and Like, Like, Like? is a good way to do just that.